Young urban designers, landscape architects, planners and other spatial designers battle on 1 June. They translate a progressive vision into a strong design for a case in the Netherlands in just one day – Helped by established professions, they do so not with words, but with images, and using the marker and sketch as an instrument! Magic Lanes in Hong Kong displays an inspiring community-design project that aims at turning a street into a place for stimulating vibrant urban life, which is rewoven with the present contemporary social fabric. 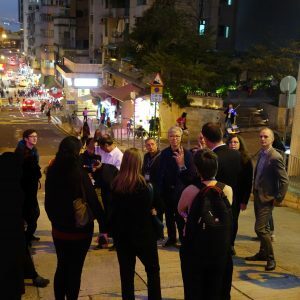 By mapping current use and envisioning potential use of urban space by local residents, the project has set a base for real-life experiments. These experiments highlight the spatial assets people own by nature. In responding to the rapid urbanisation of this early-developed neighbourhood, the project it encourages their participation in the street. Located at Sheung Fung Lane (常豐里), the space used to be an empty concrete urban space characterised by outdoor stairs and blind facades of the neighbouring parking garages, and foremost no people actually staying there. With this project, people have entered a process of place re-making. It seems the essence of what is a ‘li’ (里), because next to its contemporary connotation of ‘lane’, this notion is used more accurate as ‘place’. Yet, also, it is ironically strong because it works with the street name. The notions of ‘sheung’ (常) and ‘fung’ (常) refer resp. to eternal/unchanging and to plenty. As if, magically, a flower pot is always full of living flowers. The project incorporates the ideas of its community members and it facilitates physical changes in this space. If people are present it will be a place again. At the same day earlier, I have also noticed that many streets in Hong Kong are known as ‘toa’ (道). 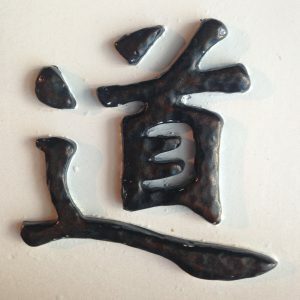 Tao, which has a much longer history, means ‘way’, ‘path’ or ‘route’, and thus is translated simply as ‘road’ today. Philosophically, again de-contextualised, this notion represents the intuitive knowing that life cannot be grasped full-heartedly as just a concept. It relates to the path human beings are on. This path is known nonetheless through the actual living experience of one’s everyday being. This may make the presence of people in space, part of the same endless path we are on, wherever we are. The ancient scholar is virtuous, subtly mysterious, deeply unknown. Once upon a time, those who knew the Way, were a mysterious and subtle people, transient yet profound, tranquil yet utterly unfathomable.